Vacheron Constantin presented the Patrimony Traditionnelle World Time Collection Excellence Platine, a new version of its renowned worldtime watch introduced in 2011 now in a precious case/dial platinum combination. 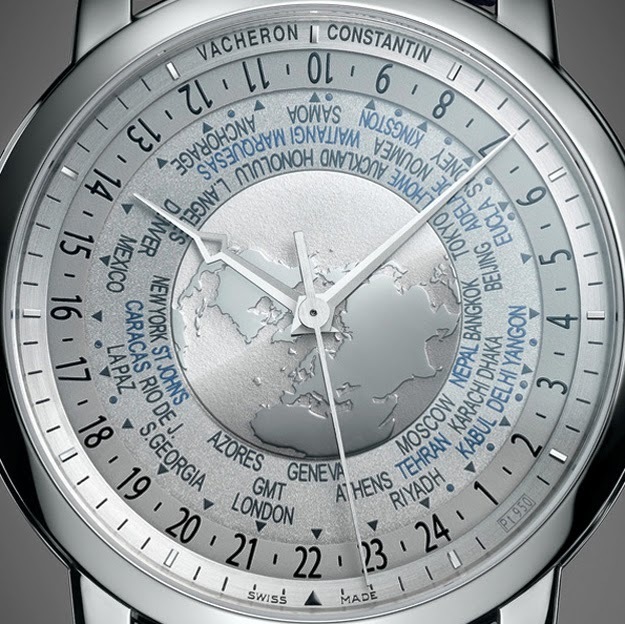 This self-winding timepiece indicates the 37 world time zones including those offset by a half-hour or a quarter-hour thanks to Vacheron Constantin Calibre 2460 WT which is protected by three patents: for the indication of 37 time zones, for the day/night indication, and for crown-operated adjustments. Despite its complex construction principles, the Patrimony Traditionelle World Time is very user-friendly. The wearer chooses the reference time and places it opposite the black triangle at 6 o’clock. The time in the reference location can then be read off either by the hour hand, or by the 24-hour disc. The time in the other 36 time zones will be simultaneously readable. The cities shown in black represent the full time zones, while the cities in red indicate half-hour or quarter-hour zones. The dial is divided into 3 main sections: a) the raised world map using the Lambert projection, a type of map often used for aeronautical charts which results from projecting the three dimensional surface on a two dimensional one, b) a sapphire crystal, of which half is tinted a shade of blue, which makes a full rotation every 24 hours to indicate day and night, and c) the metal chapter ring with 24 hour markers. The 42.50 mm-diameter case is made of 950 platinum, just like the dial and the folding clasp, and has the classic design of the Patrimony line. 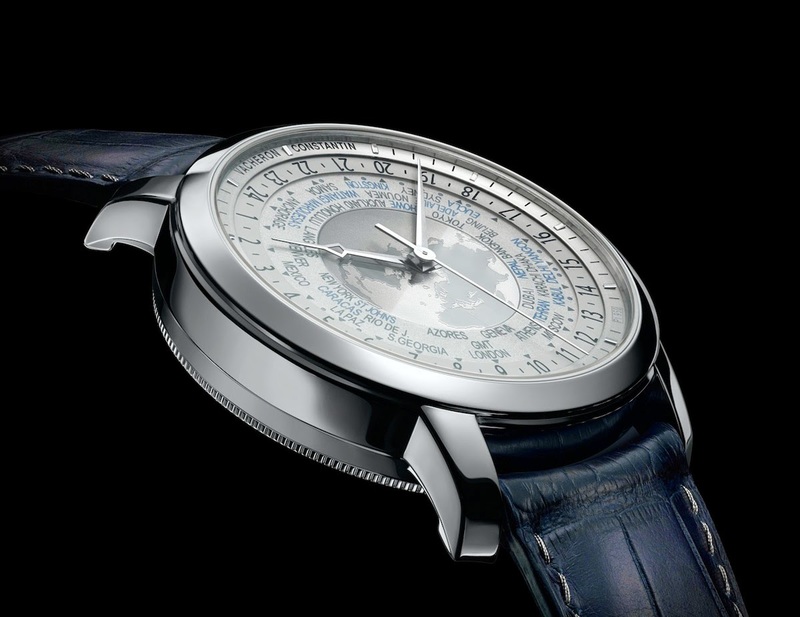 When designing the new movement, which beats at 28,800 vph and offers a power reserve of 40 hours, the Vacheron Constantin watchmakers considered the possibility of future changes of time zones in a country or in some countries and made the click ring and the cities portion of the dial changeable. It was a wise decision. In fact, since the presentation of the Patrimony Traditionnelle World Time in 2011, Russia has decided that on October 26, 2014 the time zone of Moscow which change permanently to UTC+3 from UTC+4. The platinum World Time will reflect this change. The Vacheron Constantin Traditionnelle World Time Collection Excellence Platine, bearing the prestigious Hallmark of Geneva, is issued in a 100-piece limited edition and will be officially presented at the Watches & Wonders salon in Hong Kong (Sept 29-Oct 2, 2014). To better understand how the Patrimony Traditionnelle works, you can watch the video below showing the pink gold version. Vacheron Constantin presented the Patrimony Traditionnelle World Time Collection Excellence Platine, a new version of its renowned worldtime watch introduced in 2011 now in a precious case/dial platinum combination. 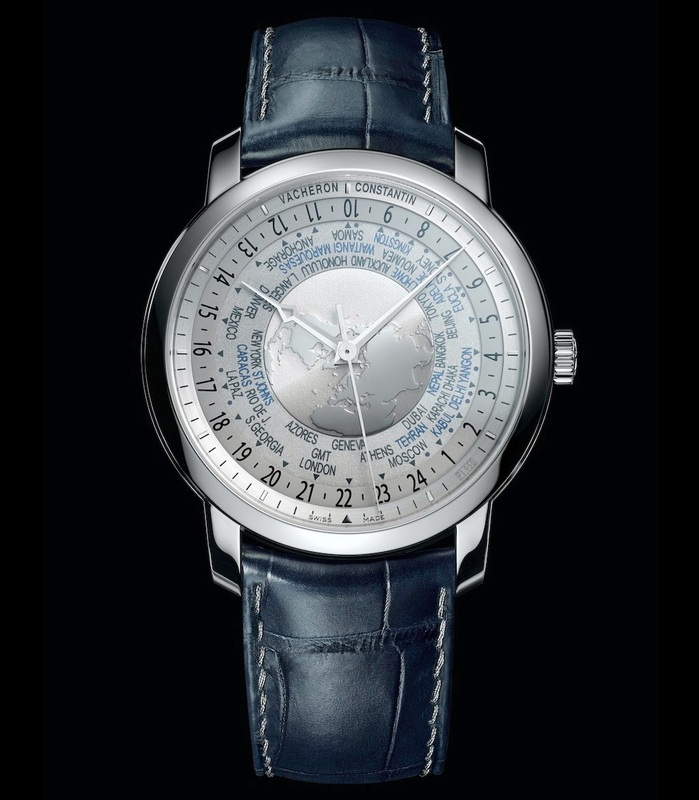 The Vacheron Constantin Traditionnelle World Time Platinum, bearing the prestigious Hallmark of Geneva, is issued in a 100-piece limited edition and will be officially presented at the Watches & Wonders salon in Hong Kong (Sept 29-Oct 2, 2014).